Welcome to yet another month. They are rushing by so fast that it's making my head spin. While we were in Alice Springs at the end of August getting the ambulance serviced, we picked Marina up off the plane from Darwin. Marina has been mentioned previously in this web page. We first met her in Wadeye where she was staying with Brin and Sarah from work (the guys with the boat and motor bikes that we used). She was back visiting Wadeye again (its that sort of place), so we rang her to say she should come to see the Canyon as she was relatively close (about 1500 km, give or take a few). It was good to see her again and she ended up staying for a week. Marina is a very low maintenance guest who helps out 200% and really pulls her weight. She was a pleasure to have to stay. During her visit we did the Canyon rim walk (about a 3 1/2 hours walk) and it rained while we were up there. They say it only rains 3 days a year so I guess that made us wet, cold but lucky. We did actually get to see a little water flow over the Canyon, so we did consider ourselves lucky. We also did a few other walks including one that is not open to the public. Once again one of the perks of this job is who you get to meet. One of the communities I visit is nestled in the base of the range. 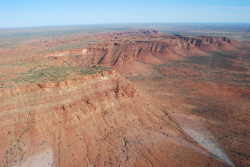 I have become friendly with the Traditional owners and they have given us permission to explore the area. There is a lovely private water hole, that would be great for a swim in summer, and even a bit of rock art. We also did the short walk to Kathleen Springs, which while not overly spectacular, is still worth a visit. September is a busy time for us with birthdays. Harry's on the 4th (aged 7) and Alex on the 9th (aged 11). The boys were so excited about the upcoming event and just watching their excitement really takes you back to when you were a kid. Harry was awake bright and early, which meant so were we. We did the present thing and then I had to go to work. As mentioned earlier there was another home schooled family in the resort, with the kids being the same age. A perfect little group for a party. Chris and Alex went to a lot of trouble, arranging games and preparing the food. Just prior to the big party and the guests arriving, we jumped in the car and drove the 200 metres to the helicopter pad. 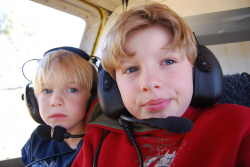 Next surprise was a helicopter ride over the Canyon and surrounding area. It was a great trip, with even, "I am so scared I'm going to be sick", Madam Butterfly, enjoying the experience. Then back home, just as the 'Rent a Crowd' drove in. 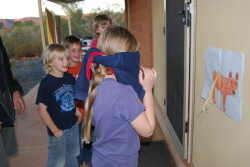 The party was fun with games, junk food, more games and more junk food. 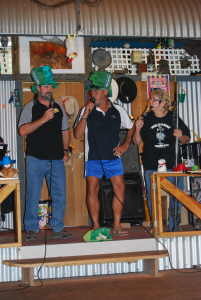 We then decided we would all go up to the Bar/Restaurant for a few drinks and watch the entertainment. 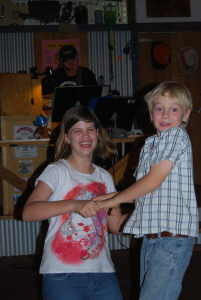 Now the couple who are the entertainers have become friends. They knew it was Harry's birthday so Petrea announced the birthday boy, with the entire restaurant (over a 100 people) singing a very loud 'Happy Birthday' to him. You should have seen the look on his face, it was priceless. He hasn't stopped talking about the 'bestest birthday ever', and he was right, it certainly was. Next it was Alex's. Now we had a really, really hard act to follow, so we didn't even try. We did the present thing, followed by No chopper ride and No party. Chris and the boys did take themselves off to the Resort Cafe for a nice lunch. I had no idea they were going, and just happened to be doing the banking over the internet, when up popped the cafe debit, right in front of me. So that's what they get up to while I am slaving my guts out!!!!! There's no hiding things anymore.We did have a nice family party that night, and he was as happy as Larry. We will have a bit of a shinding when the Priestleys arrive next week. Then in between the birthdays, was of course Father's Day. I was on call so we had a lazy day at home. Work was really quiet which gave us heaps of time to do, well not much really. We had the pressie opening, which I was very happy about. (Interesting that the female in the family can come up with the goods when required!! -Ed) I received a set of 'Light Force Roo light' spotties for the car (a perfect gift as the lights on the car are less than ordinary), a few 4x4 magazines, socks and a new stubby cooler from Marina. The spot lights came with a very comprehensive wiring loom so I was able to fully install them on Fathers Day, and go out that night and test them. Talk about an improvement. While I hope to never need to drive at night while in the bush, at least now I will be able to see further than the bullbar, which was as far as I could see with the original headlights. We ended up extending my contract at Kings Canyon for another week (total of 5 weeks) as the Priestleys were still a week away. I have really enjoyed working out here and will miss the resort lifestyle (although we are going to live at Ayers Rock Resort for 2 months after here), the locals and the beautiful countryside. Connie, the boss out here has been brilliant and I will miss her company very much (she is a 4x4 nut, with a Patrol). We got on really well and I hope we cross paths again in the future. Why is it that all bosses are not like her? Working here has been a nice mix of looking after the four indigenous communities as well as the tourists and staff. We have of course added to out art collection with a couple of paintings from Ukaka and some clap sticks and wood carvings. The weekend before the Priestleys arrived we packed the camper and headed down the Mereenie Loop, just before Hermannsburg to the Finke National Park and Palm Valley. Now we all know that this magnificent country of ours has hidden jewels scattered throughout every State and Territory. Well Finke National Park is yet another. This small National Park is only 125 km from Alice Springs and is truly spectacular. While the signs say '4x4 only' any vehicle with reasonable ground clearance would be fine. From the minute you enter the Park it is different from most. The entire area has an electric fence surrounding it in an attempt to keep out feral animals, like horses, camels, donkeys etc. They even have an electric cattle grid that is the brain-child of one of the local rangers. They say it is extremely effective and very low maintenance. I am led to believe that digging the dirt out and cleaning up a cattle grate is not much fun and very hard work so this idea sounds perfect. It simply consists of a number of lengths of stainless steel rope stretched across the track with springs and insulators at each end and an active wire to each. How simple, how portable and how cheap compared to the old cattle grids we see everywhere. The park has a great camping area that not only has flushing toilets but also hot showers. Not bad value for $10-00 per night per family. We did the Ranger's talk around the campfire which was very interesting. We have recently become new converts of the 'Guided Ranger' talks as they really give you an insight into the local area and are free. Can't go wrong at that price. Back down the Merrenie to the Canyon for our last week and for the arrival of the Priestleys. It was a busy week as we had a pile of last minute jobs to get done. One of the local indigenous communities that I visited for work has recently renovated an old building to make a school and has just had all the latest computerised gear installed for their 'School of the Air' lessons. Chris and the boys visited for the morning and participated in the morning lesson. It was very interesting, with the kids being able to see the teacher but her not being able to see them. Give them a little time to sort out some 'technical difficulties' and it will be great. Raelene, one of the mothers is the support teacher and is working hard to make it successful. Had we stayed at the Canyon a little longer I am sure Chris would have got more involved and would have given them a hand. All the kids played together at lunch time and Chris bought some hand made and painted beads from Raelene. We also had a busy social week with two groups from Bundaberg coming through. Joy, Grant and their kids had one night in the camping ground and Sharon and Jimmy (old work colleague of Chris's) stayed for a few nights. It was nice to see some familiar faces and to catch up on what hasn't changed back at home. So our last Friday in the Canyon and the Priestleys finally rolled in just after lunch. We set them up in our front yard and showed them the sights that we have called home. Saturday was a picture perfect day so we again tackled the Canyon. It really is an amazing walk and one that you could never tire of. Everybody enjoyed the day with the kids again doing really well. Sunday was a planned lay day so the Priestleys could catch their breath and so we could do a little packing. About lunch time the Clinic received a call saying there had been a helicopter crash about 40 kms away. Connie (the boss) rang me and we both rushed there in separate ambulances. Luckily for us all, everyone walked away without a scratch. The chopper on the other hand was totally destroyed and unfortunately will never again fly like a bird. That night we went to the Resort for dinner and the show. 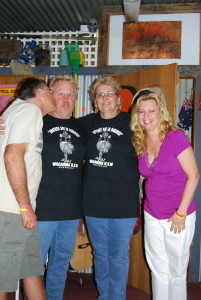 We had lined Petrea up to give both Ross and Michelle a hard time, and she did. She dragged them up onto the stage a number of times and did what she does best, entertaining the crowd at their expense. It was a beautiful thing to watch and a night they will remember. Monday we finally finished the packing and cleaning and managed to be out of the house by midday. Next stop - Ayers Rock or Uluru for those who wish to be politically correct. It is a nice straight forward 305 km trip all on bitumen. This time however we encountered a dust storm that extended all the way East to Alice Springs and goodness knows how far South.While we were lucky and only copped the dust, other areas sustained a fair amount of damage from the high winds. The dust was so bad that Mt Connor, that looks very much like Ayers Rock could not be seen at all. We knew it was there, but it was gone. 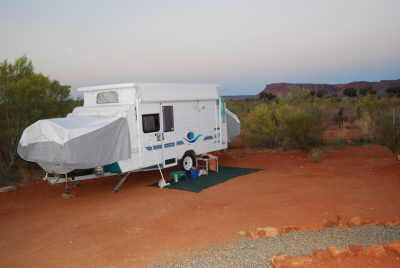 We pulled into the Ayers Rock Resort around 5-00pm, booked in and set up. The campground management were excellent when I explained that I was starting work at the clinic and awaiting our house to become available. It was a really nice introduction to our new home. Not only did they look after us, they also looked after the Priestleys, charging us only $100-00 for a week. Talk about a great deal. We had planned to stay in the campground for as long as the Priestleys stayed. As it turned out they stayed a week with us shifting into our temporary house on the Sunday, ready for work on Monday. I am not exactly sure what we did for the week, but we were all kept busy. For those regular readers, you will know that we are very fond of this part of the world. I think the rock is something that everyone should visit a least once in their lifetime. I thought Ross summed it up nicely. He said that while it may not be the most spectacular part of this country, it certainly is the 'Spiritual Heart'. I don't think I could have put it better myself. So our week seemed to end in a flash. Prior to our arrival it had been windy and that didn't change when we got here. Due to safety reasons the climb at the rock is closed in high winds (over 25 kms), if it rains(or is likely to rain in the next 4 hours) or if the predicted temperature is 36 C or above. It had been closed for nearly three weeks prior to our arrival. Well as you could imagine it is starting to get hot, so that was an issue and the wind was blowing every day, well over the 25 km. It was not looking good for us and the Priestleys to do the climb. Then on Friday morning we woke to a beautiful, still, sunny day. The climb was open so minor panic set in as we all ran around getting ready. We were standing in the car park ready to climb at 0830. We all made it to the top with the whole experience taking us about 5 hours. It is a hard and potentially dangerous climb but very much worth the calculated risk. The climb was then open again the next morning (and closed by lunch) and has been closed ever since. Now due to the high temperatures it will be open very rarely until it starts to cool off next year. 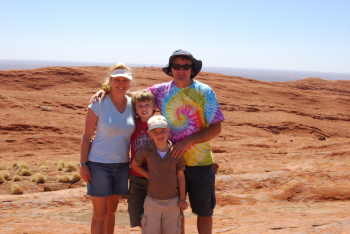 We also did the walk around the Olgas, went to numerous sunset drinks and visited the Cultural Centre. Due to the 'NT Intervention', rules and regulations regarding the consumption of alcohol have changed and that included 'No drinking' at the sunset viewing area overlooking the rock. That obviously caused a stir as the rules have been modified slightly, now allowing people to have a drink while watching the sunset at the viewing area. A very sensible decision. I must say that one of the things I like about the NT is that stupidity does not prevail as much as in other parts of this country. NT decisions in general seem to be well thought through, and if not popular are often reversed. I am not sure that would happen in other states. The National Parks are well and truly open for the public, with new parks being opened all the time, unlike in QLD where they are continually reducing access to the tax payers. They actually have a Govt Department in the NT that does nothing but plan and open new 4x4 tracks, for public use. The recently opened Binns Track is one recent example, with plenty more on the drawing board. Camping in the National Parks in the NT is plentiful, cheap and cheery, and you can just turn up without pre-booking like you now have to in QLD. I hope the NT never changes, and certainly hope it never follows in QLD's footsteps, for that would be a very sad day. The Priestleys and us also all went up to the 'Staff Res Club' for dinner (which also happened to be our wedding anniversary), which has a bar, bistro, pool and gym for staff use. Chris and I have been issued with a 'Residents Card' which gives us access to the 'Res' and discounts at the shops within the resort. It also gives us cheap access to the rock ($30-00) for 12 months. The meals at the club are good value with a real family feel about the place, with it would seem, very casual dress regulations. 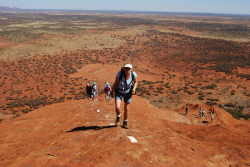 So while we enjoyed Kings Canyon, we think Ayers Rock will also be fun for a few months. Anyway more about that next month. We will be shifting into our new house and the boys will start going to school for a few days a week. Stay Tuned. And by the way. We now have mobile phone reception so you can give us a call if you wish.